Paul Roberts wants to “set the record straight” when he returns to fight at the Plymouth Guildhall next month. The nearest thing to a blemish on his pro record was recording a draw with Brett Fidoe the last time he boxed at the venue. The 22-year-old resides in Chard, Somerset, having moved from his hometown of Watford as a child, because his father was a publican. He went back to his roots when he got back to winning ways, after the Fidoe stalemate, with a four-round points whitewash over slippery veteran Anwar Alfadli. That 40-36 result came at the Woodside Leisure Centre in Watford, having debuted with the same verdict over Ricky Leach at London’s famed York Hall. His one experience of the Guildhall saw him and Fidoe handed two rounds each, referee Kieran McCann scoring it 38-38 on February 9. Roberts now gets the chance to make amends on September 15, with another ring date lined up in Yeovil on October 12. He’s hoping to land himself a shot at the Southern area bantamweight title, a belt that hasn’t been contested in nearly 20 years. He said: “I want to make a name for myself and becoming an area champion is an obvious target. A couple of warm ups and I’ll be ready for it. “I’ve boxed at super bantam so far, but I make that weight easy. I tend to come in just over the bantam limit, so I could do it. “I’d like to fight Fidoe again, but he’s not Southern! I won’t be facing him on September 15, I’d rather have something different for that one. “Fidoe was tough, strong and aggressive, but I found him a lot easier to hit than Alfadli. I took that result like a loss, everyone told me I’d done enough to win it. “Alfadli was a real box of tricks, very slippery and that brought something out of me. I think that’s the best I’ve performed so far. “I don’t want Fidoe to be my abiding memory of the Guildhall, so I want to set the record straight there. It doesn’t matter who it’s against. “It’s the closest place I’ve boxed since I turned pro, it’s about an hour and half from Chard where I’ve been for the past 15 years. It’s more like home than Watford. 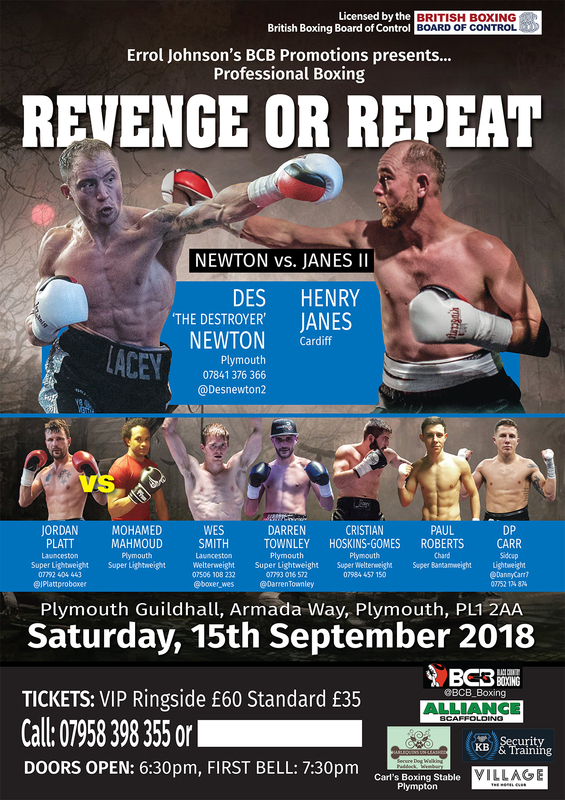 The main event at the Guildhall will see Plymouth’s Des Newton and Henry Janes clash in a rematch for the British Challenge lightweight title. There will be plenty of other local talent on show for the September 15 bill, with six bouts already confirmed for the under-card. Darren Townley features looking for a ninth from 10 outings as a super lightweight paid performer. ‘The Terminator’ won an eight-rounder on February 9 at the Guildhall. DP Carr, from Sidcup in Kent, will make the trip to Devon to complete the line up for the home corner at lightweight. Tickets are on sale now, priced at £30 or £50 ringside, and can be purchased by calling 07958 398 355. Doors open at 6.30pm on fight night, with the first bell expected for 7.30pm.